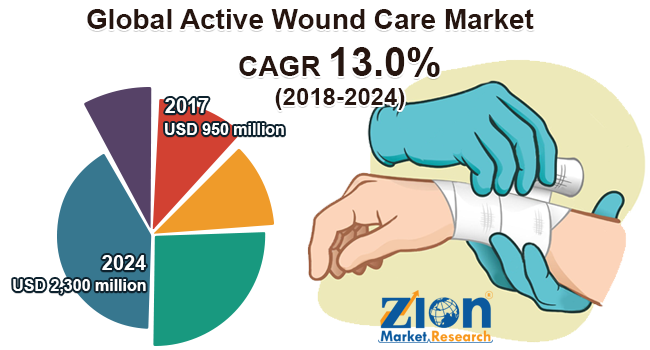 With the presence of a large pool of participants, the Global active wound care market is displaying a highly competitive business landscape, finds a new research report by Zion Market Research (ZMR). Smith and Nephew, Molnlycke Health Care AB, Integra Life Sciences Corporation, Baxter, Medtronic, ConvaTec Inc., Coloplast Corporation, Organogenesis Inc., KCI Licensing, Inc., Medline Industries, Inc., Avita Medical, Osiris Therapeutics, Inc., Cytori Therapeutics Inc., and Wright Medical Group N.V. are some of the key vendors of endoscopy devices across the world. These players are focusing aggressively on innovation, as well as on including advanced technologies in their existing products. Over the coming years, they are also expected to take up partnerships and mergers and acquisitions as their key strategy for business development, states the active wound care market study. In a major boost to active wound care market, in October 2018, J. C. Blair Health System Incorporation and Penn Highlands Healthcare Incorporation have jointly signed a letter of intent integrating their healthcare systems and functions. As estimated in this report, the global active wound care market stood at US$950 million in 2017. Witnessing a tremendous rise during the period from 2018 to 2024, the revenue in this active wound care market is expected to reach US$2,300 million by the end of the forecast period. The main product types available in this active wound care market are Synthetic Skin Grafts, Allograft, Xenografts, Amniotic Tissue Grafts, Collagen Dressings, and Growth Factors. Among the three, the demand for Synthetic Skin Grafts is relatively higher and the trend is anticipated to remain so over the next few years, notes the active wound care market research report. “Abundant government support in the form of funding for research activities, technological advancement in wound care product development, and rising diabetic &geriatric population is anticipated to contribute substantially towards active wound care market size in the years ahead,” says the author of this study. Apart from this, growing incidences of chronic ailments and rise in the frequency of surgeries across the globe coupled with rapid healing and recovery are likely to drive the growth of active wound care market in the coming years. In addition, rising morbidity due to chronic wounds across the global patient population together with economic repercussions has led to the growth of this active wound care market in lesser developed societies and communities. Furthermore, soaring number of cases of maturity-onset and type I diabetes in both developed as well as emerging economies across the globe has led to rising prevalence of diabetic ulcers, thus accelerating the growth for active wound care market. The increasing instances of mortality due to venous leg ulcers and diabetic foot ulcers amongst the elderly populations are further bolstering the demand for strategies related to active wound management in various developed and developing countries. Regionally, North America has been leading the worldwide active wound care market and is anticipated to continue on the dominant position in the years to come, states the active wound care market study. Favorable reimbursement policies, rising incidences of chronic wounds, and increase in geriatric population is the main factor behind the dominance of the North America active wound care market. The high number of market players being headquartered in North America is another significant factor that is supporting the growth of this regional active wound care market. In addition, large patient base suffering from diabetes associated with foot ulcers and pressure ulcer is also significantly contributing towards the high share of the region in the global active wound care market.